Princess Caroline's son Andrea's marriage to Tatiana Santo Domingo. Take a peek! 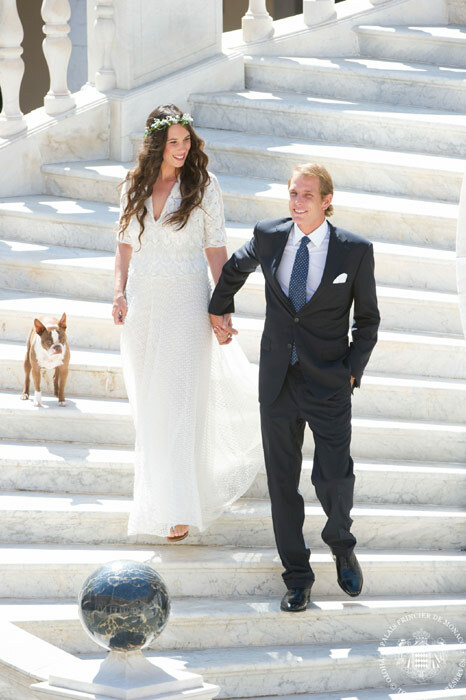 Tatiana Santo Domingo was the ultimate boho bride, forgoing a tiara for flowers in her hair. 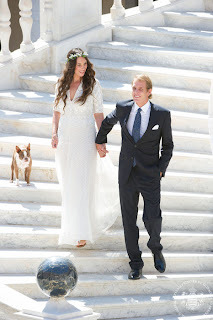 The 29-year-old married long-time love and second in line to the throne of Monaco,Andrea Casiraghi, in a V-neck Missoni dress with three-quarter-length sleeves and flat silver sandals at a small civil ceremony on Saturday. The dress’s bodice was embroidered with raffia and silk thread, and the full-length circle skirt featured layers of silk organza that matched her five-month-old son Alexander’s bloomers. 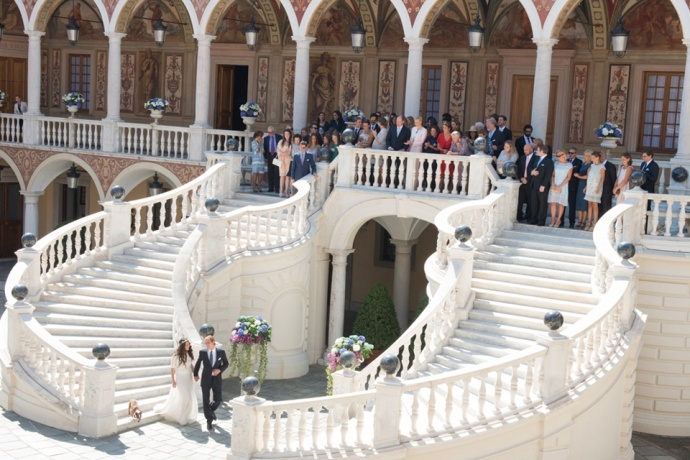 Guests gathered at the palace balcony as the bride and groom descended the stairs to join everyone for a royal celebration. The weekend began with a pre-wedding bridesmaids’ dinner on Princess Caroline’s yacht,Pacha III, where Santo Domingo paired a red Missoni dip-dye dress with a floral garland. Santo Domingo opted for Missoni as a tribute to one of her best friends, Margherita Missoni, who sadly could not attend the wedding weekend as she was 41 weeks pregnant with her first son, to be called Otto. (She posted “#waitingforotto” on her Instagram account five days ago.) Charlotte Casiraghi, Lauren Santo Domingo, Alexia Niedzielski, Bianca Brandolini, Olympia Scarry, and Eugenie Niarchos were all on hand to help celebrate, however. After the ceremony, the couple posed for photos with their Boston terrier, Daphne, while 400 guests, including Prince Albert and Princess Charlene, gathered for a garden lunch by the palace’s pool. The bridesmaids weren’t given any specific dressing instructions, but almost all were in Dolce & Gabbana or Valentino, while mother of the groom, Princess Caroline, wore a satin red dress designed by Karl Lagerfeld. A rock-and-reggae band performed as guests lounged on casual picnic blankets set up on the hillside. Everyone drank the local electric-blue-colored pastis and, just as the sun hit its peak in the sky, Princess Stéphanie and Princess Caroline’s daughters led the charge and jumped into the pool. Karl Lagerfeld arrived as everyone was taking the plunge. Later that night, the bride changed into a lace Valentino dress with long sleeves, while the groom wore a tux for the evening fete at the Hotel de Paris.